Sit down with your family and decide what kind of party you can have. You could have a day party, or, invite a few friends over for a sleepover. New Year's all about new dresses. So you can wear your best party clothes, or, dress up in "play" dress clothes. Its better to create your own invitations to send to your guests. You can also print out your invitations. Don't forget your New Year hats! You can either purchase them or you can make them. You can also buy plain hats and show off your creativity by embellishing it with beads ,feathers, streamers and almost anything you like. In fact you could even have a "Hat Making" party! Making a time capsule will also be a good idea! It's a great way to save the memories of the year. You can use a plastic container, cardboard box or even a big glass jar. Ask all your friends bring one item to put in the time capsule. It could be anything ranging from a newspaper story, a movie ticket to a photo -- whatever that reminds you of the bygone year. At the end of the party seal your time capsule. You can store it in a safe place and take it out whenever you feel nostalgic. Food is the next important thing. If you are having an evening party simple snacks will do like popcorn and chips. Do remember to make arrangements for cold drinks as well. Get hold of some fun "kid" friendly drinks to ring in the new year. Traditional New Year foods are thought to bring luck. Many cultures believe that anything in the shape of a ring is good luck, because it symbolizes "coming full circle," completing a year's cycle. For that reason, the Dutch believe that eating donuts on New Year's Day will bring good fortune. Many parts of the U.S. celebrate the New Year by eating black-eyed peas usually accompanied by hog jowls or ham. Black-eyed peas and other legumes have been considered good luck in many cultures, and the hog symbolizes prosperity. Cabbage is another "good luck" vegetable, and in some regions, rice is the "lucky" food that is eaten on New Year's Day. Make sure you have a clock in the room to countdown the end of the year if you are allowed to stay up late. When the clock strikes twelve, yell out "Happy New Year" in a chorus!! When the clock strikes 12!! Invites:-Let the theme for this new year party be the clock. If you are pretty confident about your creativity, then you can use your computer and some clipart and take print-outs of your invites. In fact you can position the hands of the clock in a way that your guests understands at what time the party commences. Decorations:-On the entrance, hang a huge cut-out of a clock and write the words "WELCOME" in colorful letters. hang clocks from the ceiling. Alarm clocks are not at all expensive. Set all of them to midnight. Tie toy-watches around the napkins. Party decoration remains incomplete without balloons. Hang them everywhere and flaunt your creativity by drawing clocks on the balloons with permanent markers. 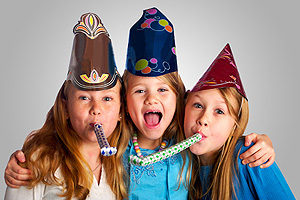 Party Games:-Provide your guests with pencils and paper and ask them to write as many New Year resolutions as they can think of on slips of paper. The resolutions can range from serious to silly stuff. Ask them to fold the resolutions and put them in a basket and shuffle all the chits. Ask your guests to take out one. If they don't think the resolution is for them, they have to try to give it away to someone else. Have them read their resolution out to the others beginning with "I resolve…". Whatever the theme may be a party is bound to be dull without balloons. 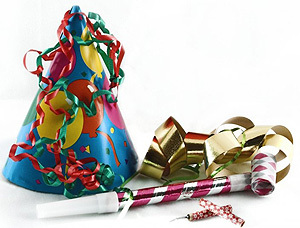 So why not arrange a all-balloon party this New Year? The party begins with balloons, ends with balloons and has billions of balloons in between. All you need is a little hot air. Invites:-Blow up a balloon and pinch the end. Write party details on the balloon using a felt-tip pen. Deflate the balloons, insert in envelopes and mail. The guests will have to blow up the balloons to read the party details. Costumes:-Use the balloons in a creative way as part of their costume. One guest might tie inflated balloons to his shoes, another might make a tie out of deflated balloons and another might create an interesting balloon hat. Have them wear the balloons accessories to the arty and award a prize for the Most Imaginative Costume. Decorations:-Tie balloons to every tree, shrub, fence post and anything else in your yard.Use helium balloons tied together to make archways or canopies. Balloon Bounce:-Have the players keep the balloons up in the air using only their heads-or feet! Tennis Balloon-Give the player tennis rackets and have them pair up. Let them bat a balloon back and forth over a net, table or fence. Players score one point if the balloon hits the ground on their opponent's side of the net. Volley Balloon-Divide the group into two teams on either side of a volleyball net. Have them play volleyball with a balloon. Balloon cake:-Bake cake mixture in a well-greased, round, ovenproof bowl a little longer than the baking instructions recommend. Insert toothpick to see if the cake is finished; if no mixture sticks to the toothpick the cake is ready. Remove cake from bowl and decorate with icing tinted to a favourite color. Write any party details on the cake with piping bags. Make a string at the bottom of the cake with icing or licorice. Surround the Balloon Cake with balloon-shaped cupcakes. When the clock strikes twelve, ask all your friends to get hold of as many balloons as they can and welcome the new year with the sounds of bursting balloons.